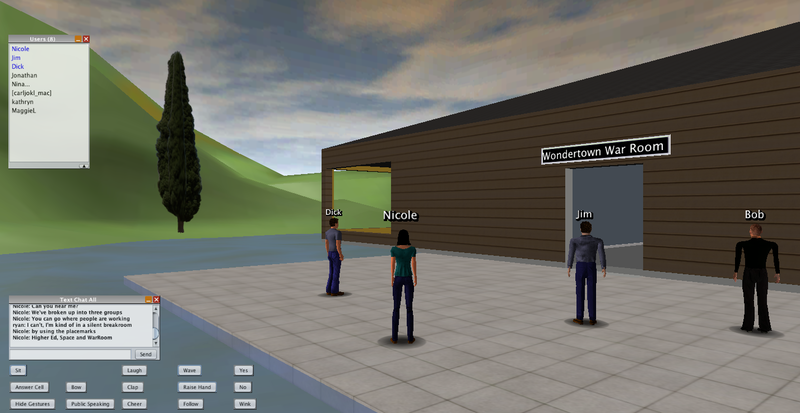 Today’s Wonderland Wednesday World Building session served three purposes: to help people learn some world building techniques, to start the process of creating of a new Wondertown community space, and to test the build candidate for Open Wonderland v0.5 Preview4. The group decided at the end of the session that the build was just about ready to release. Two of the major bugs – the web server hanging problem and the terrible flickering on Windows clients – both seemed to be resolved. A third fix, to improve the way turning gravity on and off behaves, wasn’t quite right, so Jonathan is going to take one more stab at fixing that before creating the final Preview4 release in the next day or two. In terms of the session itself, we began with a Wondertown Planning Board meeting, brainstorming about the layout of the “town” and the types of content we might want to include. For models that do not include a .kmz download link, download the most recent SketchUp version and then use File –> Export –> 3D model to save as .kmz. We then broke up into three groups, each working on a different type of content. The “Higher Ed” team spent most of their time learning and practicing world building techniques, so they didn’t get too far along on the design of their space, but they did find a nice university building to experiment with. The “Space” team got started on a Solar System simulation, finding models of all the planets and placing them the correct distance apart. 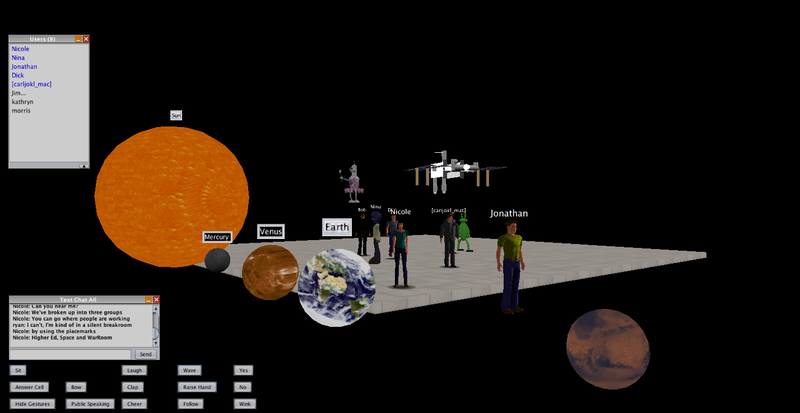 They made good use of the Poster module for labeling the planets. The “War Room” team found an interior space to use as a war room and placed it on an island in an isolated mountain terrain. They used the Poster module to hang a sign above the door. 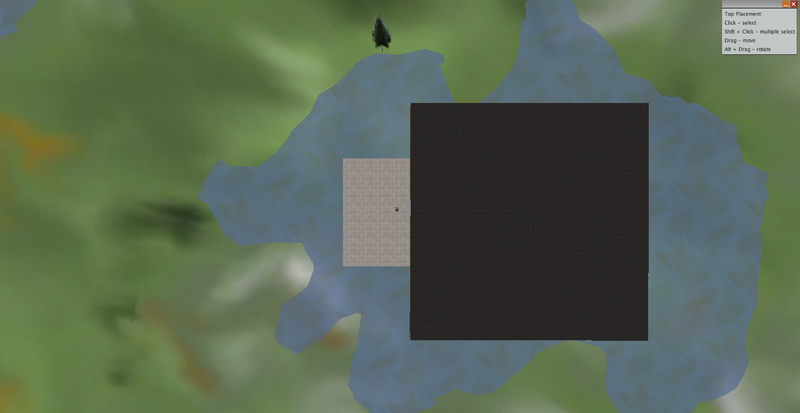 They also used the Top Placement view to move around the terrain so that the building was centered in one of the lakes. This yielded a nice view out of the windows. In under two hours, the group made a great start on building out Wondertown. 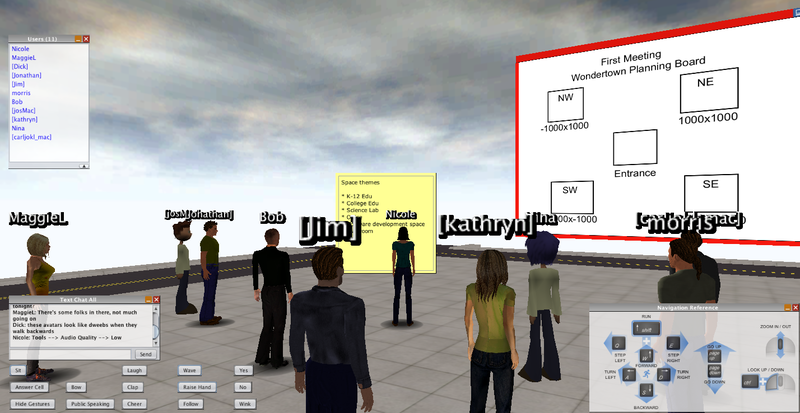 We saved a snapshot and will periodically do more group building sessions to continue to develop this new virtual space. Others are more than welcome to join these follow-on sessions. Please visit the events portion of the Open Wonderland Facebook page to find announcements of these and other events. If there are groups of community members in either Europe or Asia who would like to participate in a world building session, let me know and we can arrange some sessions at more convenient times. This week’s Wonderland Wednesday session will be a bit different from others. Taking an idea originally proposed by community member Morris Ford, we’ll be using the newest version of Wonderland to work together to build “Wondertown.” I’ll start things off by running a short brainstorming session on how best to organize the space and then I’ll providing some tips on finding models from the Google 3D Warehouse that perform well in Wonderland. After that, the group will break up into teams of two or three people and each group will work to create a piece of Wondertown. I don’t expect that we’ll finish the project in one session, but I’m hoping we can get a good start. We have started using Facebook to organize Open Wonderland community events, so please visit the Wonderland Wednesday event page for the complete announcement. We’d appreciate it if you could RSVP so we have an idea of how many people to expect, but you’re always welcome to join even if you didn’t RSVP. 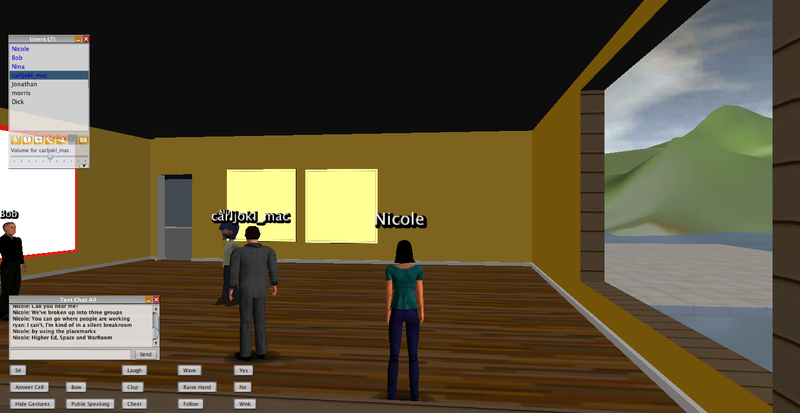 If you plan to join us, please download and install Google SketchUp if you do not already have your own copy. Also, we ask that everyone participating also join the #wonderland chat channel on irc.freenode.net. This enables us to communicate with everyone in case we run into any problems or need to make any last minute server changes. For example, if we have too many people interested in this session, we’ll start up another server and break into two groups. 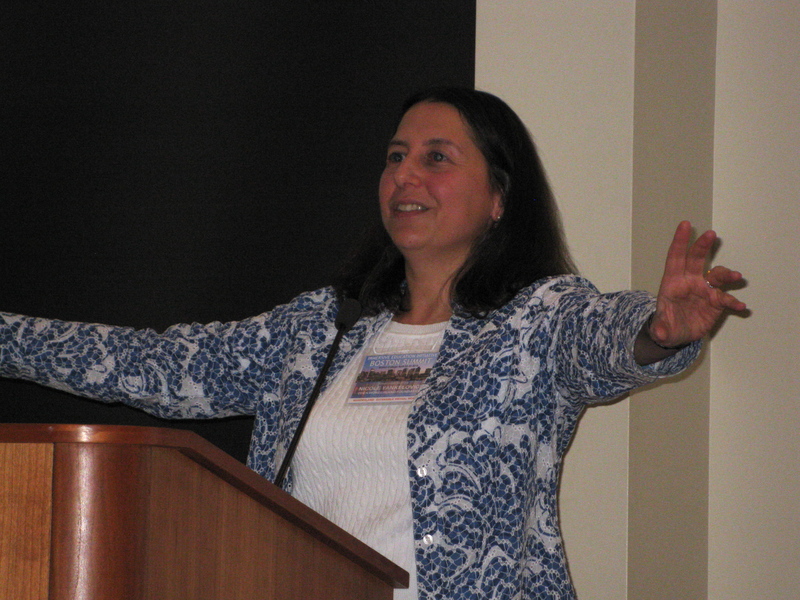 I gave a rare in-person talk yesterday at the Immersive Education Boston Summit. Robin Heyden wrote up the first day of the conference, including a detailed summary of my talk in her blog article Immersive Education Summit (Day 1). My favorite part of the talk was the Q & A session where members of the audience chimed in to answer many of the questions asked. It’s exciting to have so many members of the Wonderland community gathered here. Tonight we’ll be having our first face-to-face Open Wonderland Foundation board of directors meeting. And tomorrow I’ll be doing an extended demo and Wonderland World Building workshop as well as participating on a Future of Immersive Education panel. If you’re interested in hearing what’s going on live at the conference, follow the Twitter hashtag #iED. 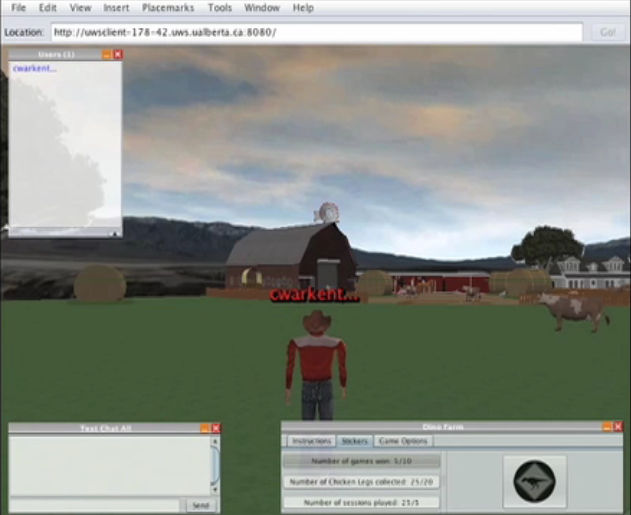 An undergraduate student team at the Computing Science Department of the University of Alberta just developed a game in Wonderland to help with the rehabilitation of children with Cerebral Palsy. 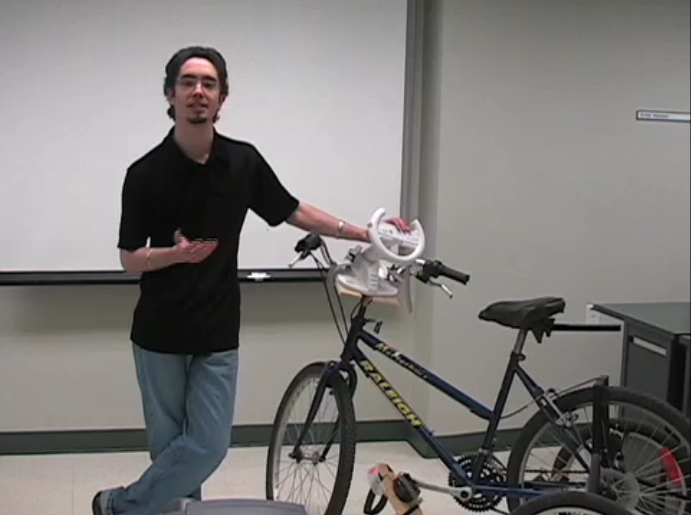 They have instrumented a special bicycle with SunSPOTs to control a collection game in Wonderland. Pedalling the bike moves the avatar forward. 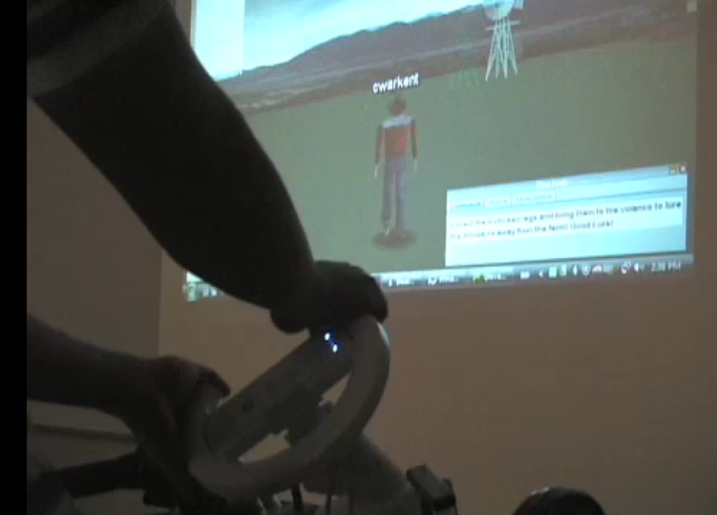 Turning the handle bars with the Wiimote steers the avatar. You can see a video of their demo at http://ssrg.cs.ualberta.ca/index.php/SunSPOTs-in-WL. This is part of the SmartCondo project, an interdisciplinary project among Computing Science, Rehabilitation Medicine, Industrial Arts and Design and Pharmacy at the University of Alberta and the Glenrose Rehabilitation Hospital. For any questions, please contact the team leader, Eleni Stroulia (stroulia@ualberta.ca). I would be particularly happy to see as many of you as possible at the Immersive Education Summit in Boston. Not only will I be there in person, but almost the entire Open Wonderland Foundation board of directors will be attending. The program is filled with Wonderland-related content. In addition to my keynote talk, Professor John Belcher from MIT will be talking about his use of Wonderland in physics education, Michael Gardner will be giving a talk on three Wonderland projects that he’s involved with at the University of Essex (MiRTLE, SIMiLLE and +Spaces), and a student from Aizu University in Japan will be describing his work on a new music browser for Wonderland. I’m particularly interested in learning more about the work going on at the IAVANTE Foundation on immersive medical training. Finally, there will be “Wonderland Behind the Firewall” workshop. If you are able to attend the MetaMeets conference in Dublin, please let me know. I’m looking for someone to help “drive” Wonderland during my talk. I look forward to meeting as many of you as possible, either in person or in Wonderland, in the coming months. 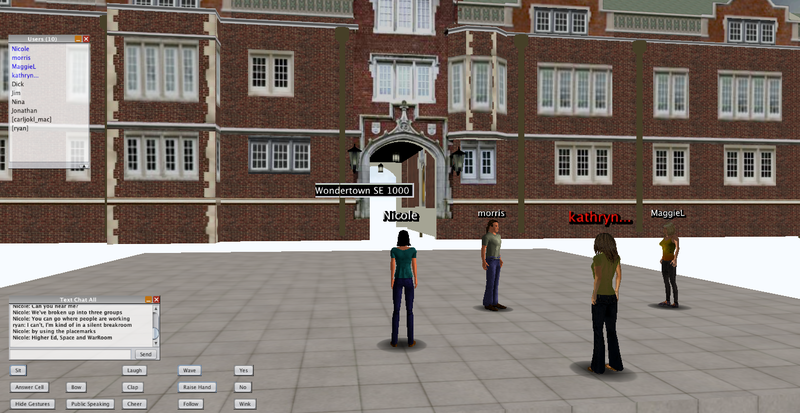 Join other Wonderland developers in an informal walkthough of the MTGame code. Wonderland Wednesday sessions are intended to help bring developers up-to-speed on the existing Wonderland code base. As preparation for these events, it’s a good idea to download your own copy of the source code. Please note that we are now using a Facebook Event page for RSVPs. It’s helpful for planning purposes to know how many people will join. You are currently browsing the Wonderblog blog archives for April, 2010.